The nation’s top federal tax resource, the U.S. Master Tax Guide® (2019) , has been updated to provide complete and reliable guidance on the historic Tax Cuts and Jobs Act, as well as pertinent federal taxation changes that affect 2018 returns. Virtually all taxpayers are impacted by the changes to the U.S. tax structure, with individual taxpayers and businesses witnessing the most significant changes. By having access to the most sought-after resource on the market, you will gain a complete understanding of updated tax law explanations and will receive guidance on the major tax reform provisions. The U.S. Master Tax Guide was meticulously researched to cover today’s federal tax law and was expertly-written to help identify tax planning opportunities, ensure accuracy when filing taxes, maximizes your knowledge of the Tax Cuts and Jobs Act and serve as a quick reference guide when providing tax services to your business or clients. 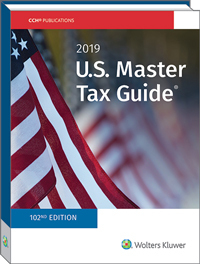 U.S. Master Tax Guide (2019) is also available in an eBook format which you can download to your computer instantly.